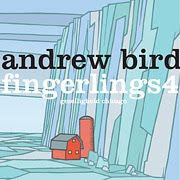 Mr. Bird's latest, Fingerlings 4. Worth it if only for the amazing Jay Ryan cover. 04 You Woke Me Up! Linda Bruner - "Don't Let Me Down"
Lou Reed - "Waves of Fear"
Jim Carroll Band - "Wicked Gravity"
Rolling Stones - "Moonlight Mile"